A child’s First Holy Communion is one of the most important events in their life. Help them make the day extra special with a gift of a First Communion Desk Stand. 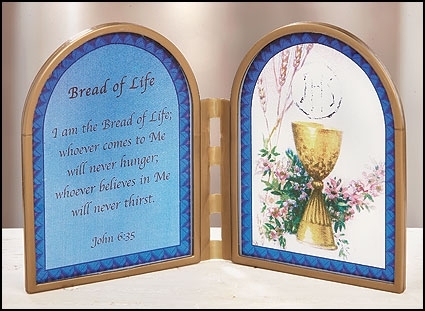 Each stand contains a First Communion prayer on one side and a full-color chalice and host image on the other. They make a great gift for any Communicant and perfectly capture the joyful spirit of their First Communion Day. They are an ideal keepsake that will be treasured for years to come. I am the Bread of Life; whoever comes to Me will never hunger; whoever believes in Me will never thirst.